On almost any international trip we’ve certainly encountered some foods that, well, we are just not accustomed to. Even New York and Louisiana are home to two of the top 10 most bizarre travel foods. Malaysia – Durian; Durian is considered a delicacy in some parts of Malaysia, and has been known to sell for $50 (U.S.) for one fruit. Many people love the taste of durian, but its powerful aroma is so offensive to some that airplanes, trains, and buses often prohibit the fruit in passenger areas. Madrid, Spain – Callos; A casserole made with blood sausage and tripe, which comes from the intestines of various domestic animals. This dish is popular in Taberna de Antonio Sanchez in Madrid, Spain, where it is often served as tapas, small dishes designed for sharing. Philippines –Soup No. 5; Soup made from the back and testicles of a cow is eaten at Balaw Balaw in Luzon, Philippines. In the United States, cow testicles are also sometimes referred to as “Rocky Mountain oysters” and can be prepared in a batter and then fried in oil and eaten with hot sauce. 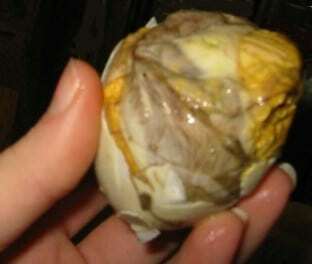 Of course, any trip to the Philippines is not complete with some balut. What strange foods have you found in your travels domestic or abroad? Personally, I like the taste of fried cow intestines (kokarec in Turkey). Any others? Mmm…Durian! I tried it for the first time with the aide of my Couchsurfing host in Singapore. After all the build up about smell, I was surprised to enjoy it. And I didn’t think it smelled that bad to boot. I tasted my first durian in Malaysia in the posh Suria KLCC shopping center at the base of the world’s tallest buildings, the Petronas Towers, in downtown Kuala Lumpur. The owner there told me that durians taste like heaven and smell like h*ll.